Both men and women desire to have beautiful, healthy hair, but few are lucky enough to be able to take their hair’s health for granted. Remember that hair is a fast-growing tissue and what you eat can make a huge difference in your hair’s health. It’s important to nourish your hair from within. 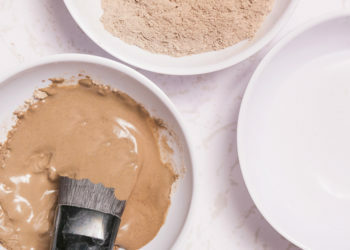 Protein, which is the main building block of hair, is an essential nutrient, along with complex carbohydrates, iron, B vitamins, fatty acids, sulphur and zinc. Your diet should have a perfect balance of these. Some superfoods can help promote hair growth and solve different hair problems. 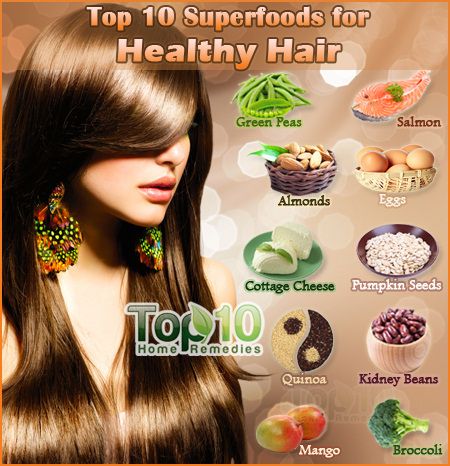 Here are the top 10 superfoods for healthy hair. There are plenty of reasons to put salmon at the top of the list. It is full of protein, omega-3 fatty acids, iron and vitamins B12 and D. All these are essential for healthy hair. Omega-3 essential fatty acids help keep your scalp supple and hydrated. A deficiency of this nutrient can cause dull-looking hair and even hair loss. Meanwhile, the high amount of protein, iron and vitamin D in salmon improves hair strength and prevents breakage. By including salmon in your diet, you can enjoy shiny hair as well as better hair growth. You can have baked, grilled or smoked salmon depending upon which you prefer to eat. For better hair growth and texture, you need to eat lots of protein. Hair is made up of keratin, which is a kind of protein. Eggs are one of the best sources of protein. The protein present in eggs is considered high-quality protein and is excellent for hair growth and strength. Plus, eggs contain biotin and B vitamins that play a major role in preventing hair loss problems and improving overall scalp health. Try to eat one egg daily or every other day. You can eat scrambled eggs, fried eggs or boiled eggs depending upon your preference. Nuts like almonds, pecans, cashews and walnuts are good for your hair. But almonds are considered the best for preventing hair loss and promoting hair growth. Almonds are loaded with zinc that plays a key role in maintaining healthy circulation in the scalp, which in turn provides shiny, healthier, well-moisturized hair. Almonds also contain a high level of omega-3 fatty acids that add shine and volume to your hair. Being rich in vitamin E, almonds also help prevent split ends and promote growth of healthy hair. Keep a small bag of dry roasted almonds with you and eat them as snacks whenever you feel hungry. You can also soak two or three almonds in one-half cup of water overnight. In the morning, peel the skin and eat them. To take full advantage of the nutrients present in broccoli, eat raw broccoli heads as a snack or in salad three or four times a week. Quinoa has a nutty, earthy flavor and is great in stews and curries. It is also perfect for adding to salad or baked goods. Kidney beans are an excellent source of essential hair care nutrients. Along with protein, kidney beans are a rich source of iron, zinc and biotin. Protein helps strengthen the hair strands and promotes hair growth. Biotin is also essential for optimum hair health and its deficiency can cause brittle hair. Even the American Dietetic Association recommends three or more cups of kidney beans each week to enjoy stronger, shinier and thicker hair. Kidney beans can be added to salads, casseroles and side dishes. You can also puree them into dips and spreads. Cottage cheese is a great food for your hair. It contains whey and casein, two high-quality proteins that prevent dry scalp. Without adequate protein, hair can become dry, brittle and damaged. Plus, cottage cheese has vitamins D and B-5, which play a major role in hair growth. It is also a good source of all the essential amino acids needed for healthy, beautiful hair. 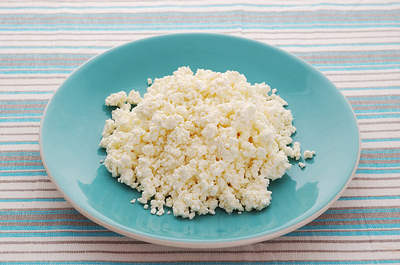 You can eat cottage cheese as a snack, or try including a few cubes of cottage cheese in your salad or soup. Green peas contain a wide variety of vitamins and minerals that are essential for healthy hair. They have iron, zinc, and potassium that keeps hair vibrant and strong. 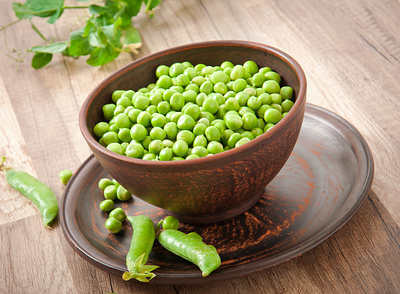 Peas also contain B vitamins, such as folate, B6 and B12, required to create red blood cells that carry oxygen and nutrients throughout the body, including to your scalp. Plus, the high amount of vitamin C present in peas is needed in the hair follicles for optimal growth. You can eat both raw and cooked peas to enjoy healthy hair. Boiled peas can be added to salad, soup or any kind of dish. Pumpkin seeds are one of the best foods you can add to your diet if you want healthy hair. 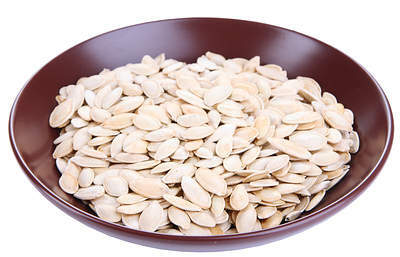 Pumpkin seeds contain protein, zinc, selenium, biotin, potassium, copper, iron, B vitamins, vitamin E, magnesium and calcium. They are also high in omega-6 fatty acids that contribute to healthy as well as thick and shiny hair. You can eat lightly roasted pumpkin seeds as a snack, add a spoonful to salad or soup, or sprinkle some in your bread or other baking recipes for added flavor. Mangos are rich in vitamins and minerals that nourish as well as promote hair growth. This juicy fruit is rich in vitamin C, an essential for making collagen that gives structure to hair. Vitamin C also helps with absorption of iron in the blood. Iron deficiency disrupts the normal hair growth cycle and may result in hair loss. Plus, mangos have vitamins A and E. While vitamin A helps fight dandruff, vitamin E improves scalp circulation and encourages hair growth. 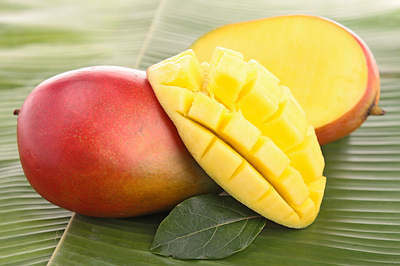 You can eat mangos as a whole fruit or drink mango juices or smoothies. Mango slices are also a tasty addition to yogurt. You can improve the growth, texture, shine and overall health of your hair by eating these flavorful superfoods that can be easily incorporated into your diet. So nice of you for your advice..